Celebrate Mother’s Day by baking this dressy cake that is surprisingly simple to make. Blood oranges combine with hazelnuts, polenta, maple syrup, and olive oil for a heart-healthy treat that tastes like it’s covered in orange marmalade. I got my love of baking from my mother Dorothy, and this beautiful silver tray from my mother-in-law Corinna. This post goes out to both of you with love, and to all of you mothers out thereâ€¦ whether you are mothering children, pets, the earth, or your fellow humans. 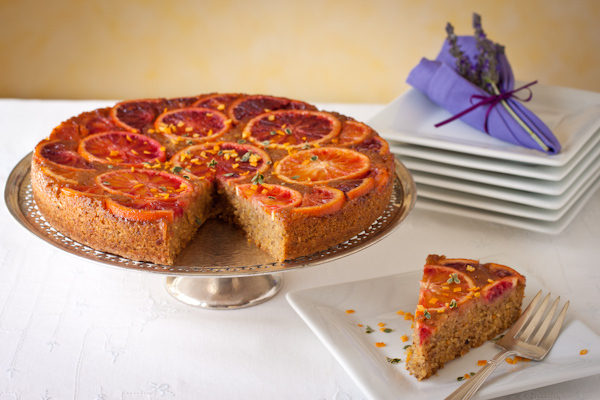 This cake came into being because I had four blood oranges from our CSA basket, and it seems wrong to simply peel and eat them. They are so beautiful and sweet, with nice thin skins. 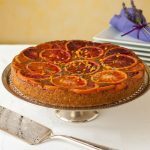 I started thinking about an upside-down cake to show off their color, and remembered this amazing lemon olive-oil polenta cake I had at fellow blogger Sally Cameron‘s house last year. So I looked at five or six upside-down cake recipes, and about five or six olive-oil polenta cake recipes, and started to meld them. Usually I pick one recipe that’s close to what I’m envisioning and go from there. I used Sally’s recipe as a starting point, because it was already gluten-free (she’d adapted it from a cookbook by Deborah Krasner to make it gluten-free for a client). I wanted it to be vegan and have no granulated sugar, as I need to get back off the granulated bandwagon. Is there a Granulated Bandwagon? That actually might make a good name for a band. 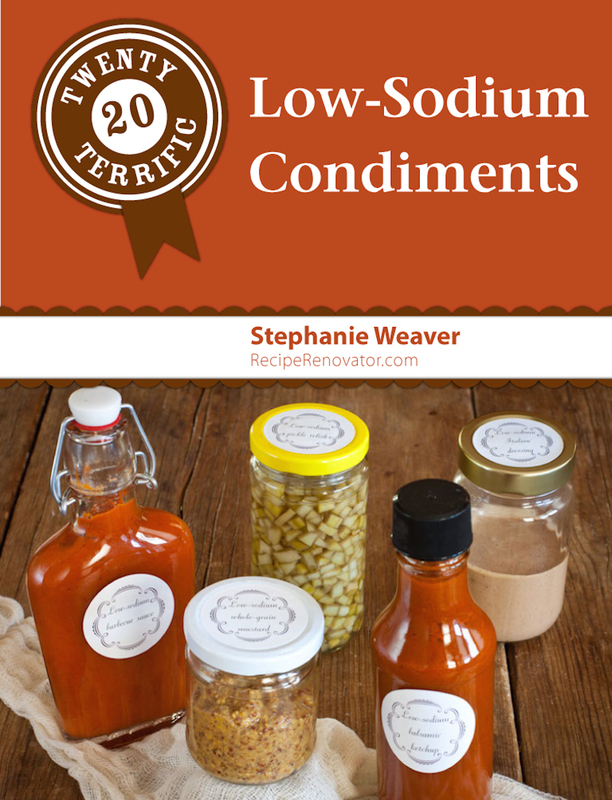 I had to adjust the recipe considerably, as using a liquid sweetener instead of a dry granulated product can be tricky. I also had no idea if this would even work. The batter is made in the food processor, plus a small saucepan for the glaze, so it’s very easy. Kids could help with this by arranging the fruit on the bottom of the pan. It’s always fun to flip the finished cake over and see what it looks like. How do you like to celebrate Mother’s Day? Do you have a favorite cake or tradition? Please tell us about it in the comments. All of our recipes are gluten-free, sugar-free, and made with plant-based ingredients to help you build a healthy life. Suitable for Meatless Monday. Look for midweek posts on meditation, service, and life lessons, helping you create inner balance. I love making upside down cakes, this is a great twist on the original pineapple recipe I have. Can’t wait to try it. WOWZERS Steph! Not only is that one sext looking cake, the ingredients sounds sooo scrumptious. 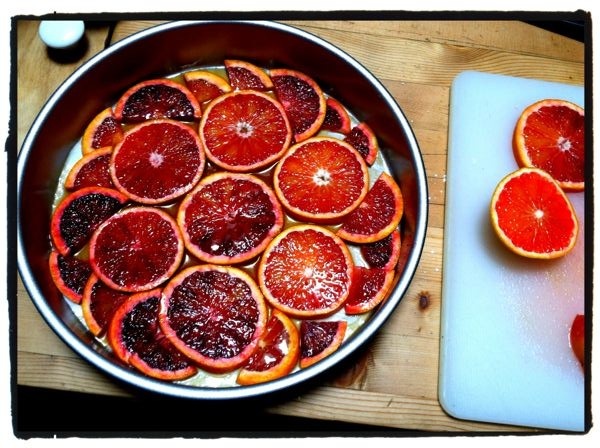 Ohh the hazelnuts, maple syrup and blood oranges? I’m in. What could you use instead of maple syrup? Coconut sugar, honey or liquid stevia? Also do you think amond meal would work instead of the hazlenuts and gluten free flour? I would use honey, liquid coconut nectar, or agave syrup in place of the maple syrup. You could replace the ground hazelnuts with almond meal, but I would still use a gluten-free flour blend in the recipe. Straight almond meal doesn’t have the same characteristics. Let me know what you end up trying and how it turns out! This is gorgeous! Blood orange season is over here, but I am saving this for next winter. It was so nice to finally meet you in person! I’m glad we got to chat last week. Thanks Brandi! It was great meeting you in person too!